Giant’s Causeway is located at the foot of about 40,000 basalt columns in County Antrim on the north coast of Northern Ireland. Giant’s Causeway is located at the foot of about 40,000 basalt columns in County Antrim on the north coast of Northern Ireland. It was created from an ancient volcanic fissure eruption, and was declared a UNESCO World Heritage Site in 1986, and in the following year a national nature reserve by the Department of the Environment in Northern Ireland. 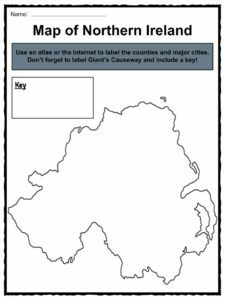 See the fact file below for more information on the Giant’s Causeway or alternatively, you can download our 23-page World Heritage Sites: Giant’s Causeway worksheet pack to utilise within the classroom or home environment. The columns at Giant’s Causeway, according to legend, is that they were built by a giant. Archaeological discoveries and research indicate that during the Paleocene Epoch (about 50-60 million years ago), Antrim frequently experienced volcanic activity. The cooling and contracting of lava resulted in pillar-like structures which have produced the columns that visitors see today. The Bishop of Derry, who visited the site in 1692, is credited with discovering Giant’s Causeway. The following year, tourists were allowed to come and visit as a result of a presentation to the Royal Society by Sir Richard Bulkeley who had attended Trinity College in Dublin, Ireland. 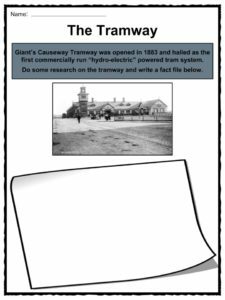 The site became popular with tourists during the 19th century, and this was due in part to the opening of the Giant’s Causeway Tramway. Tourists can now walk over the basalt columns; these are located about half a mile from the entrance to the site along the edge of the sea. 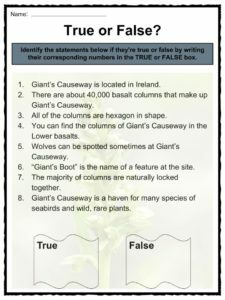 There are many names for some of the notable touristy features at Giant’s Causeway; they include the “Organ”, “Giant’s Boot”, “Giant’s Eyes”, “Giant’s Harp”, “Shepherd’s Steps”, the “Honeycomb”, and other interesting names. A new visitor centre opened in July 2012, and has had mixed reviews. The coastline of Giant’s Causeway is shaped like a dramatic jagged cliff; longer fissures that look like bands of dark rock, move out towards the sea. There were up to three periods of volcanic activity; these produced the Lower, Middle, and Upper Basalts. In the Middle Basalts is where the columns of the Giant’s Causeway can be seen and these were a result of variations in the rapidly cooling lava rate. You will notice that the columns are mostly hexagonal in shape but there are some with 8 sides as well. Giant’s Causeway is a haven for many sea birds such as the fulmar, shag, redshank (pictured to the right), the razorbill, petrel, and several others. Several rare plants can be seen at Giant’s Causeway as well, including frog orchid (pictured to the right), sea fescue, and many others; these have been documented by the National Trust. 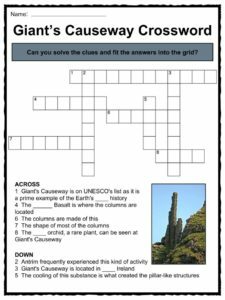 Part of the reason the Giant’s Causeway made the UNESCO World Heritage Site list is due to it not only being a prime example of the earth’s evolutionary history, but also as an example of rare natural phenomena. Some of the columns at Giant’s Causeway are over 35 feet tall. The columns look a bit like a giant rock path or bridge across the water; this ties into the myth about a warrior crossing them to Scotland. Each column is locked together, due to their similar shape and size. When looking down at the columns, they appear to start at the cliffs and disappear into the sea. Giant’s Causeway is located a few miles from the town of Bushmills in County Antrim. Weathering has caused some of the columns to form a more circular structure, and these are called “giant’s eyes” by locals. The rocky coastline around the Giant’s Causeway has resulted in many shipwrecks; one in particular occurred in 1588 when over 1,000 men on a Spanish ship sank – today those rocks are known as Spaniard Rock. The Giant’s Causeway sees approximately 300,000 visitors per year and this number is always increasing. 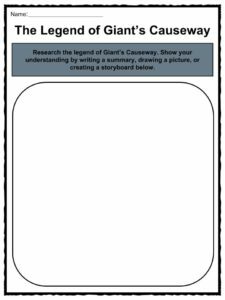 This is a fantastic bundle which includes everything you need to know about Giant’s Causeway across 23 in-depth pages. 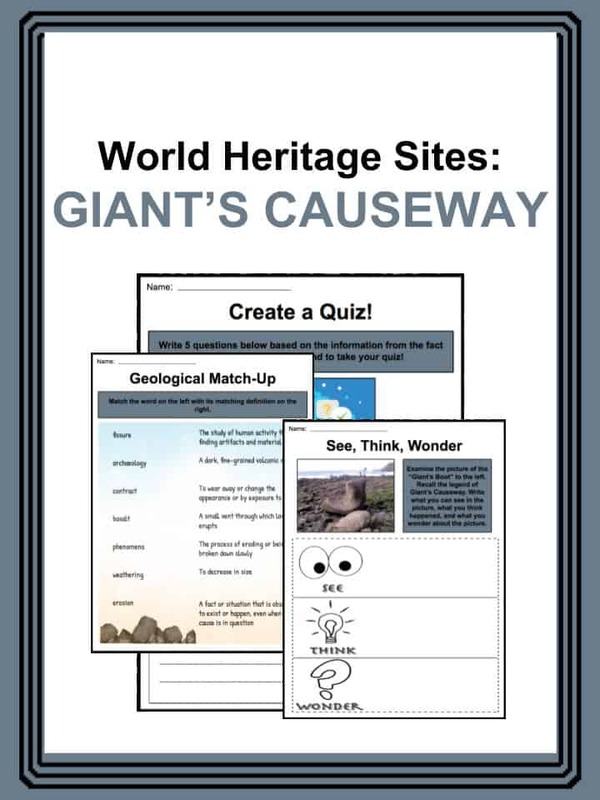 These are ready-to-use World Heritage Sites: Giant’s Causeway worksheets that are perfect for teaching students about the Giant’s Causeway which is located at the foot of about 40,000 basalt columns in County Antrim on the north coast of Northern Ireland. 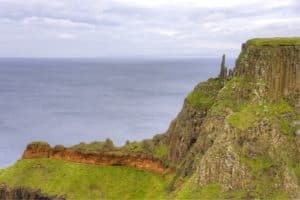 It was created from an ancient volcanic fissure eruption, and was declared a UNESCO World Heritage Site in 1986, and in the following year a national nature reserve by the Department of the Environment in Northern Ireland. 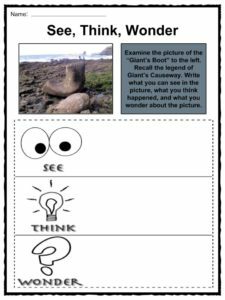 The Legend of Giant’s Causeway.